The first few days (and weeks) of law school I was honestly a nervous wreck about 75% of the time. I felt so inadequate and like I was flying completely blind. I studied constantly, barely slept, compared myself to everyone else and was a mess. Eventually, I figured out how to case brief, read faster, answer a cold call and still get some sleep in the process. As things get easier and you figure out what you need to do and how you need to do and the stress and nerves slowly melt away. 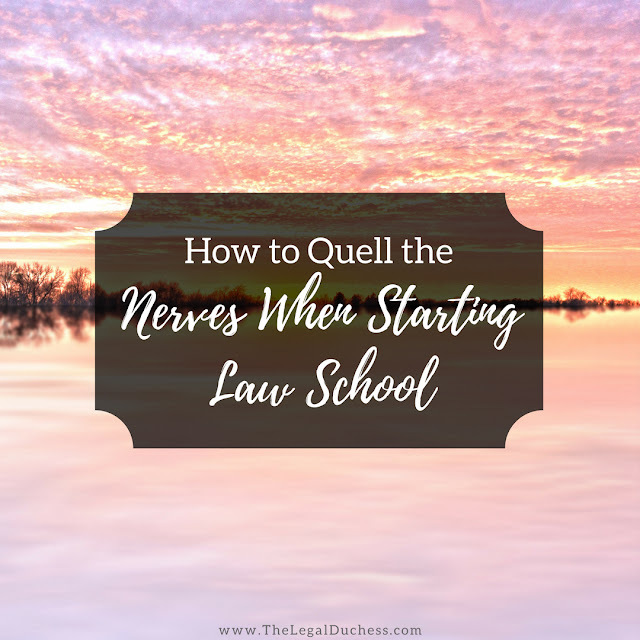 To avoid some of my mistakes and make your first few weeks easier, here are some tips on quelling your nerves in the first few days/weeks of law school. Law school throws highly intelligent, top of the class and competitive students into one big pot. It is so nervewracking to know that for the first time in your life, everyone is just as smart as you and maybe even smarter. You may get nervous when someone answers a cold call flawlessly or gets the highest grade on the first writing assignment. If you let this get to you and you compare yourself, it will drive you nuts. It is much less stressful and nerve-wracking to stop worrying about everyone else, stop comparing yourself and just focus on YOU and what YOU need to do. Even better, never start comparing yourself. Law school is, after all, a solo endeavor so the only person you need to be concerned with is numero uno. You know what is super stressful and nerve-wracking?? Being unprepared. Avoid all that stress and do your work. Be prepared for class, do your homework and study regularly to reinforce the concepts. It's a simple concept that seems like a no-brainer but seriously, the more you are prepared, the less stressed and nervous you will feel. There is nothing better than finding a 2L or 3L to go to with questions. Many law schools do a mentor/mentee program and match you up. If they don't, feel free to reach out to teaching assistants or friendly upperclassmen. It is so reassuring to find someone who has been through this, maybe had your professors and can reassure you that you're doing fine. My mentor was so wonderful through my first few weeks and seriously made me feel so much less stressed about things and eased my nerves. Don't limit yourself to one- the more upperclassmen you befriend, the more knowledge you can gain from their experience. The less sleep you get, the higher the emotions get. Heightened stress, fragile nerves... not fun for the first weeks in a highly difficult and completely foreign schooling experience. Even though it may be easy to convince yourself stay up and read just a bit longer or read another case brief, sleep is so important. I am very guilty of forgoing sleep in favor of getting things done and sometimes I run myself into the ground. I find it much easier to stay relaxed and less nervous when I have had a decent nights sleep. Sleep also helps feed your brain and keep it running in tip top shape- for law school you need all the brainpower you can get so get some darn sleep. Working yourself into an exhaustion will not help you in the long run. Following my above points, work smarter not harder. Instead of staying up until 3am reading, get it done early in the day, grind it out and just be done. If you type faster than you write notes while reading, do that. If you work best without noise, find a silent spot and get to work. The smarter you work and the better quality of your work, the less stressed you will be and nervous you will be when you walk into class the next day. If you can get the work done in 2 hours, don't drag it out to 4 hours.... that's not smart. Get the work done in 2 hrs, watch an hour of TV and get to bed an hour earlier. You have to be smart to get into law school so put those brains to good use and find the smartest and most efficient work process without sacrificing quality. The less stressed and nervous you are starting out law school, the more you will enjoy the experience. While it is not fun right at the beginning, the more you can do to make it easier and less stressful, you should do. Sacrificing your mental health for grades is just not worth it. I am a month into 1L and I have a really bad habit of comparing myslef to others epacailly when I am in my study group. It has gotten to the point where my anxiety is on overload. Do you have any other tips on how to get out of this mindset?